Remember the T-Mobile G2? Probably not too clearly because it has been discontinued for well over a year. Yet still, it was a great phone upon launch – well made, with a relatively quick processor, decent hardware keyboard, and support for fast cellular data transfers. 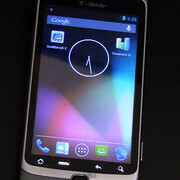 Unfortunately, the T-Mobile G2 was never updated to anything beyond Android 2.3 Gingerbread. That, however, does not mean it can't run anything newer, albeit in the form of a custom ROM provided by the CyanogenMod team. What you will see in the video below is Android 4.2.1 – the platform's very latest version released to date, installed on a T-Mobile G2. And as a matter of fact, the smartphone performs much better than you might expect, even though the hardware inside it is a far cry from what powers today's high-end smartphones. Now check out the video below and if you have a T-Mobile G2 lying around, perhaps you might give this custom ROM a try. Just make sure you head over to the XDA Developers forum for further information before proceeding. Will G2 become, HTC HD2 of Android world......??? Well iam not a fan of particular brand.but thats in fact an advantage of Open source.not everyone can afford Flagships. First point, china phones do not have the same dev support as a well known flagship or regular phone. Second, "buy a rockchip, root it, install a capable jellybean launcher" you just showed you ignorance by saying install a jellybean launcher, i believe you meant a jellybean ROM and quite frankly i highly doubt there will be one for the china phones as their dev support is quite weak, unless you believe ROMs fall from the trees. ok then i am not THAT mad. My first smartphone. Bittersweet watching this. I hear ya, Knight. Bittersweet for me for a different reason. My G2 has been stuck on Gingerbread since I got the upgrade & that's where it will forever reside. I had to get a new phone to feel that JB love. But, I am happy to see that someone got it up & running. is it stable? devs, please work on rezound too!! !